There is atleast one instance, although not significant in whole scheme of things, where Mahabharat (the epic) and Sholay (hindi movie) have similarity. I am discussing the incident when Gabbar Singh killed Salim and asked the villagers to give Jai and Veeru to them. After a bit of discussion, a decision was taken when Rahim chacha pointed that when he is not turning his back on Jai (Amitabh Bacchan) and Veeru (Dharmendra) even when he has lost his young son. 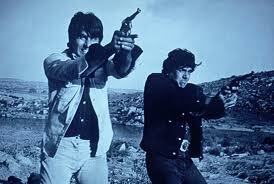 Jai and Veeru are delivered to Gabbar Singh, at a place specified beforehand. When the robbers of Gabbar Singh’s gang pick them up, they find a note attached on the back of Veeru and Jai. It says – “Gabbar Singh. agar tum ek maroge, hum chaar maarenge”. Though this line is not as famous as other dialogues, but has the intensity. When dacoits turned the bodies of Jai and Veeru, they started firing and killed all dacoits, except one, to tell the happenings to Gabbar. I find this piece interesting as there is a similar story in the epic Mahabharat. in Ek chakra Nagri, Vakasur used to demand large amounts of grain. He also demanded a person should be sent to him daily to satiate his hunger. When Pandavas were travelling, they reached this place and found the happenings. They decided to do something about this and surely, Bheema was sent with the cart which was sent to Vakasur daily. 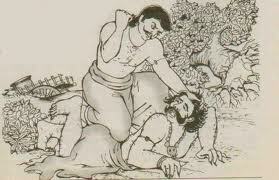 Soon enough, Vakasur came out and killed by Bheema. The last scene of this hindi movie Sholay is also important, where Jai dies. This scene can also be compared with the death of Abhimanyu, who died fighting with kauravas, when Arjuna was away. This is similar again as Arjuna was also away and Abhimanyu stepped in time to save the day for pandavas. To take this further, parallels can be drawn between Thakur and Shri Krishna also. They did not fight the war themselves, but the war could not have won in absence of them. Their proteges, Pandavas and Jai-Veeru took care of the enemies. And lastly, their stance signified one thing, victory of good over evil.